In 1997, Nicolas Paré opened the doors of Le Fournil to Seattle's Eastlake neighborhood. Originally from Nantes, he began his apprenticeship at the young age of fourteen. He then traveled the world, working as a baker in Nantes, Paris, Canada, Mexico, Santo Domingo, the Bahamas, New York, and finally in Seattle. This life-long love affair with baked goods inspired him to share his passion with Seattle. In France, picking up a baguette is an essential daily errand, so he decided to create a place people could easily come for freshly baked bread and beautiful pastries on a daily basis. 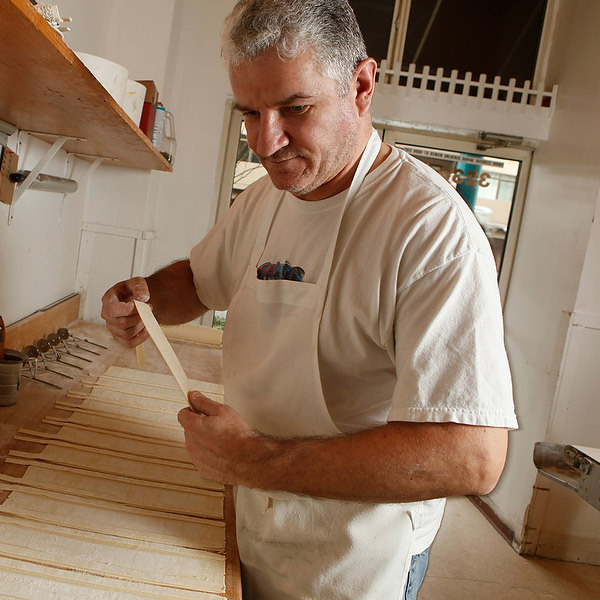 Today, he continues to knead and bake in his own Eastlake shop. Nicolas prides himself on the quality and affordability of his product, and judges his success by the smiles on his customers' faces. Owner of Le Fournil, LTD. In addition to the daily offerings of our Eastlake café, we also deliver boxed lunches, breakfast and pastry platters for special events and corporate meetings. All production and baking is done adjacent to our Eastlake location. You can even watch our bakers work from the sidewalk! We thank our valued customers for their continuing patronage, and for sharing our passionate enthusiasm for our food!